I'm learning new chord progressions from my guitar instructor, and while I played them accurately--and knew where my fingers went for each chord--I wasn't playing fast enough yet. 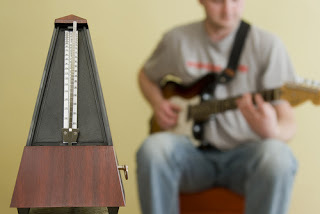 "Practice with the metronome before the next lesson, and set it a little faster each time," he urged me as I was leaving. "The faster you play, the less time you'll give yourself to think. That's what makes you hesitate." To reduce excessive rewrites: If you're wasting time agonizing and rewriting your pieces over and over, you're missing the chance to write more, or get lunch, or practice. Forcing yourself to finish within a tight time limit might just be the rubric you need to push your piece forward. Better: Time yourself, and don't allow rewrites. To hone your decision-making: All writing (and editing) is a series of choices. Do you struggle with yours? When you time your writing, you can see how you make those choices--and where you run out of time. And if you focus on improving your time, you'll learn how to make those decisions faster and better. In case of emergency: It's a core skill, not a frill, to know how to write well on a deadline. Once a month, set what seems like an irrational deadline -- in minutes instead of months, or a half-day instead of two weeks, or three articles in the time of one. Then do it again, with less time. By the time the crisis rolls around, you'll be ready. To find out what you need to work on next: Your best-honed skills will stand up to a time test. Your weak spots will show. Track where you stumble in a timed writing test, then focus on shoring up that skill. You can use a clock or a stopwatch--or the 750 Words site we wrote about last week, which tracks the time your 750 words took, and how productive you were during the arc of your writing session. Try timing one genre at a time, then move on to another once you've improved your time. Want more advice on communications strategies, training and content? Just subscribe to For Communications Directors now. It's my free monthly email newsletter.